Paul Riley and the Philadelphia Independence seemingly got everything they wanted in Friday’s WPS Draft. When I spoke to the coach on Wednesday, he said they would be looking for a striker, some defensive depth, and a goalkeeper. In their six picks, the Independence added three strikers, two defenders, and a goalkeeper. 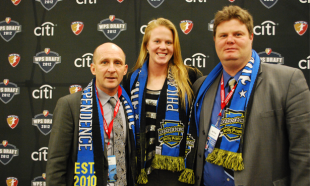 With the 5th pick in the first round, Philadelphia used their first pick to select Sarah Hagen, a highly rated striker from the University of Wisconsin-Milwaukee. A physical forward at 5’11, Hagen had 93 career goals, best in UW-Milwaukee history. She scored 26 goals during her senior season. Hagen will add depth to a striking corps that already includes Tasha Kai, Amy Rodriguez, and Meghan Lenczyk. With their second and third (11th and 12th overall) picks in the draft, the Independence added some much needed defensive depth in taking Coco Goodson from UC-Irvine and Toni Pressley from Florida State University. Goodson, a 5’11 center back, will provide cover for Nikki Krzysik and Kia McNeill, who were the only two natural center backs on the Philadelphia roster last season. One wonders if Pressley, another center back, could possibly be pushed into an outside position, with Leigh Ann Robinson and Estelle Johnson at present the only outside backs on the roster. With the 13th overall pick, the Independence addressed a clear need for a goalkeeper by taking Bianca Henninger from Santa Clara University. USWNT No. 2 Nicole Barnhart is the only keeper currently on the Philadelphia roster, and she looks to miss a significant amount of time with the Olympics in 2012. Henninger was the first keeper taken in the draft and has featured for the US at the U-16, U-17, U-20, and U-23 levels. With their final two picks (17th and 21st overall), the Independence drafted two more strikers in Danielle Foxhoven out of the University of Portland and Jasmyne Spencer from the University of Maryland. With so many strikers on the roster already, it’s possible Foxhoven and Spencer might not see the pitch this season and instead might play for Paul Riley’s WPSL side, New York Fury. Overall, the Independence must be pleased to have addressed some obvious needs in their roster by adding much needed depth. Hagen looks to be a handful physically and will likely feature off the bench as a target striker. Goodson and Pressley should also see the pitch this season on a fairly thin back-line. Henninger might be forced into a starting role when Barnhart leaves for the Olympics if Philadelphia does not add another veteran goalkeeper. 3 forwards, 2 defenders, and a goalkeeper? Sounds like a hockey team. Can’t wait for the season to start. Any idea when the WPS will be releasing the schedule?